This page contains various maps of Europe and the world that will hopefully add context and understanding to your studies. It will be expanded throughout the semester so check back often. Below are several maps to use early in the course. Be sure to note locations of provinces and regions across Europe. Since many regions changes hands, it is more beneficial in some ways to know the region as opposed to the nations. This map outlines the progression of the 100 Years War. The war starts outside the scope of the course, but its conclusion helps shape the early years we study. 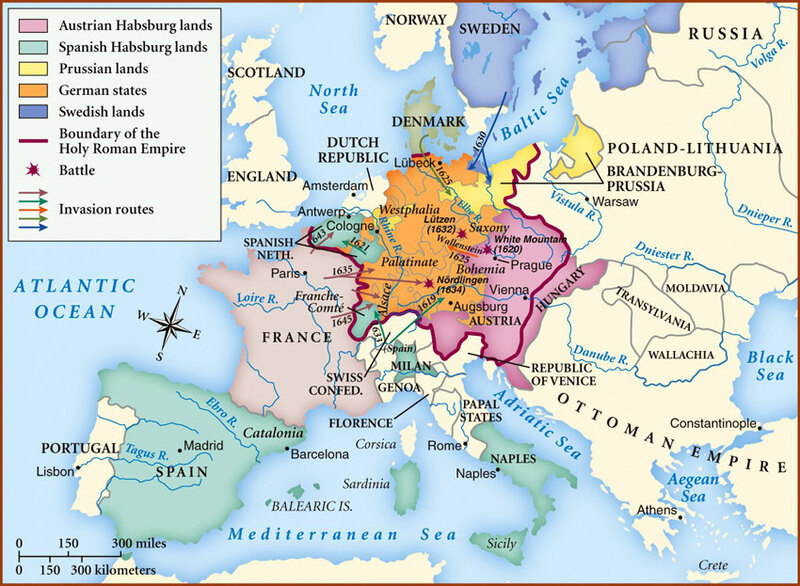 From the early 1500's to the end of the devastating 30 Years War Europe underwent several important changes. 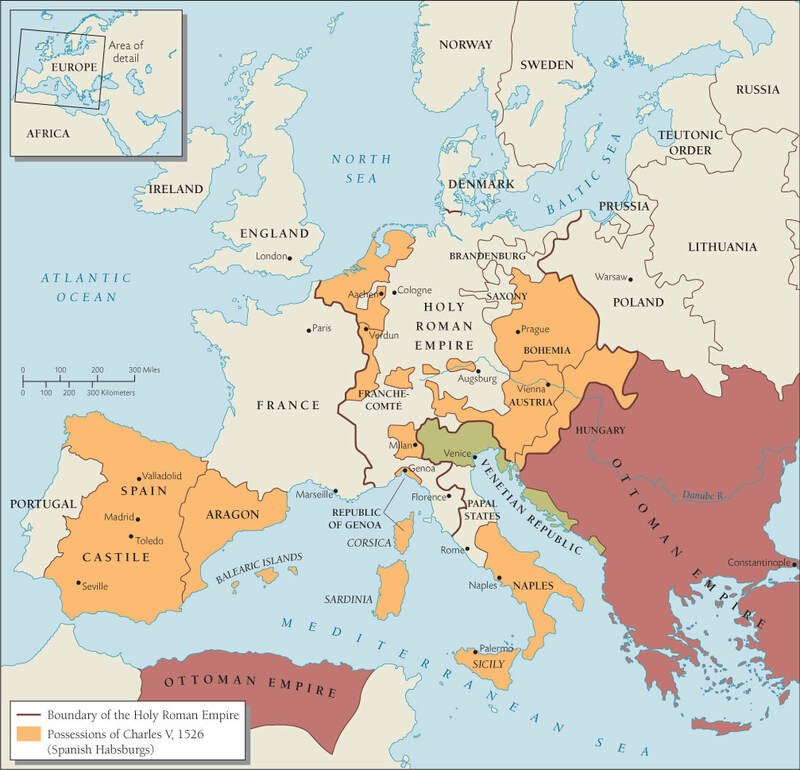 This map outlines the impact of the Reformation on the end of Catholic unity throughout Western Europe. 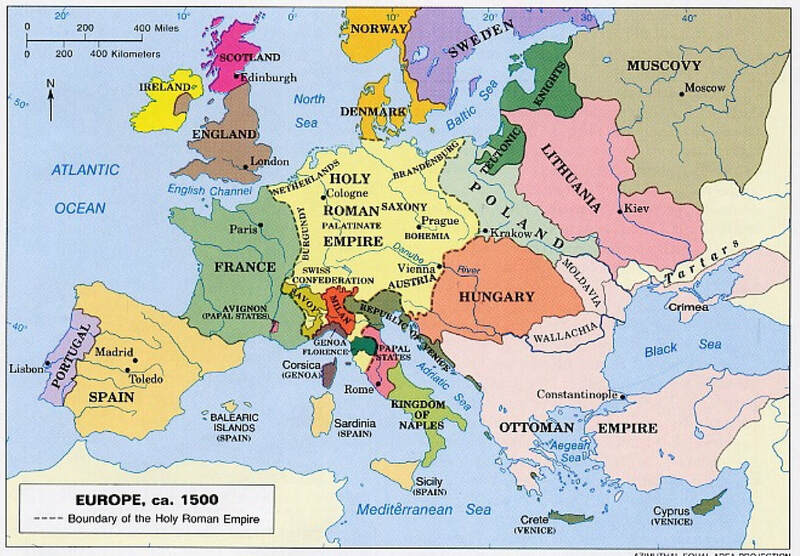 This map shows Europe at the start of the 30 Years war. Additionally it shows the various invasions of outside powers during the course of the war. From 1450 onward Europeans explored the globe with a great variety of consequences. The late 17th and 18th century saw a lot of conflict across Europe. Some of the maps below will hopefully give context for the major engagements. 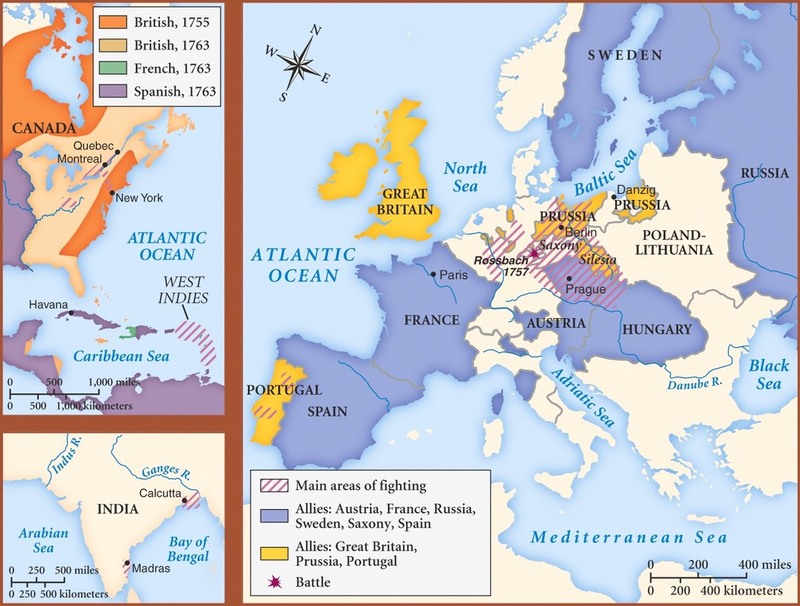 This map outlines the opposing sides during the 7 Years War. Sometimes regarded as the first global -- or world -- war. This map shows the areas where witch trials and witch persecution were concentrated. This section outlines trends in French society leading to the revolution and events from the Revolutionary and Napoleonic wars up to 1815. This map shows the expansion of communication lines and literacy rates in the years leading up to 1789. Throughout the 19th Century changes continued. 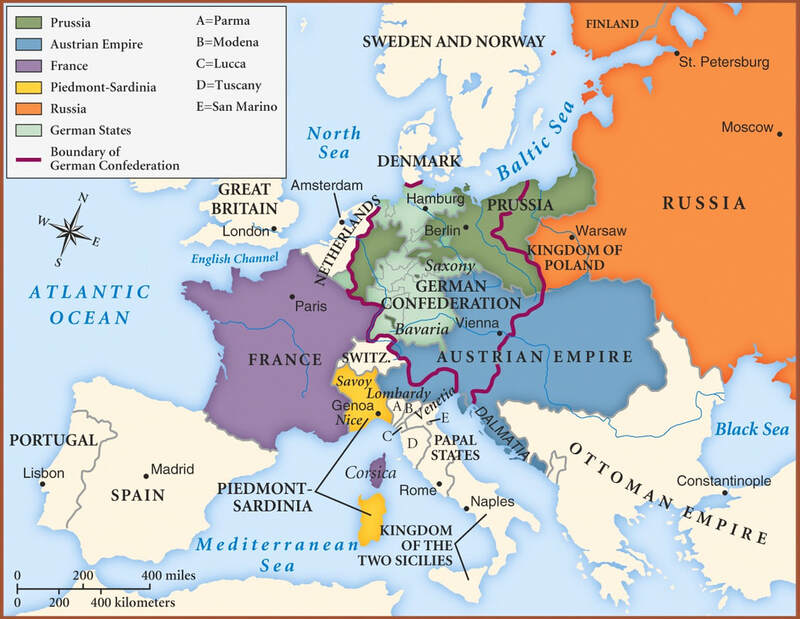 The Congress of Vienna redrew the map following the Napoleonic Wars. The Revolutions of 1830 and 1848 also brought about some small territorial changes, but more significant political ones. 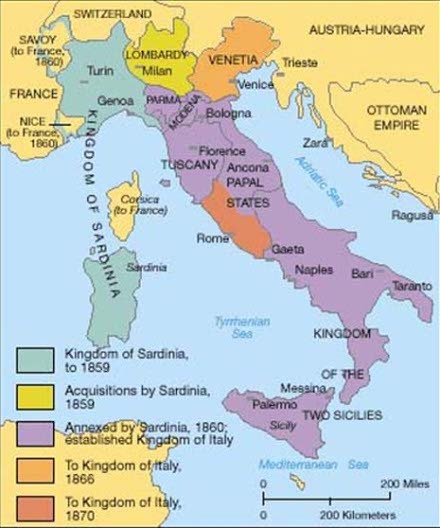 By mid-century the process of unification was underway in both Italy and Germany, with both nearly unified by 1871. Additionally, outside Europe the process of "Imperialism" accelerated with various European states seizing territory around the globe. 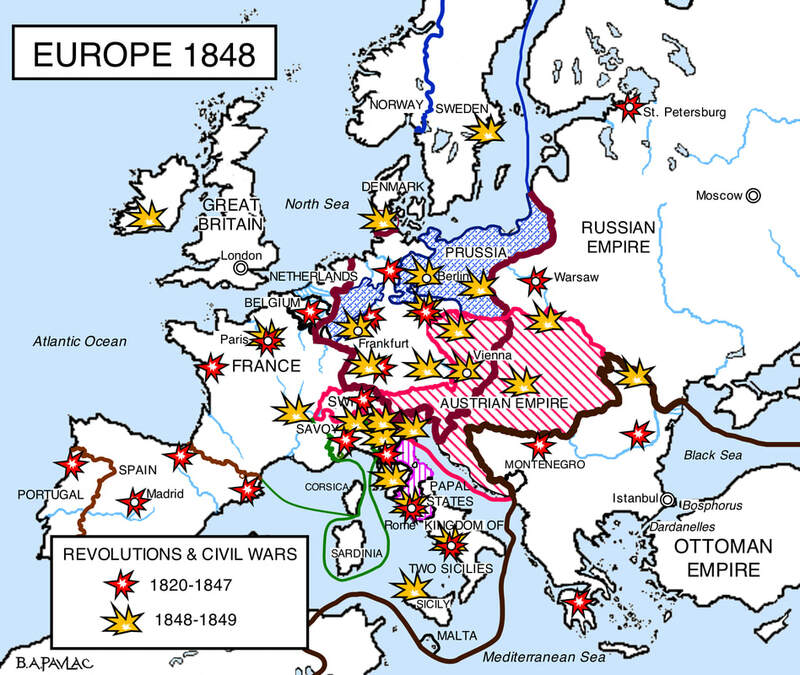 This map shows Europe at the conclusion of the Congress of Vienna in 1815. This map shows the extent of revolution from 1820 to 1849. The 1848 revolutions were particularly widespread. 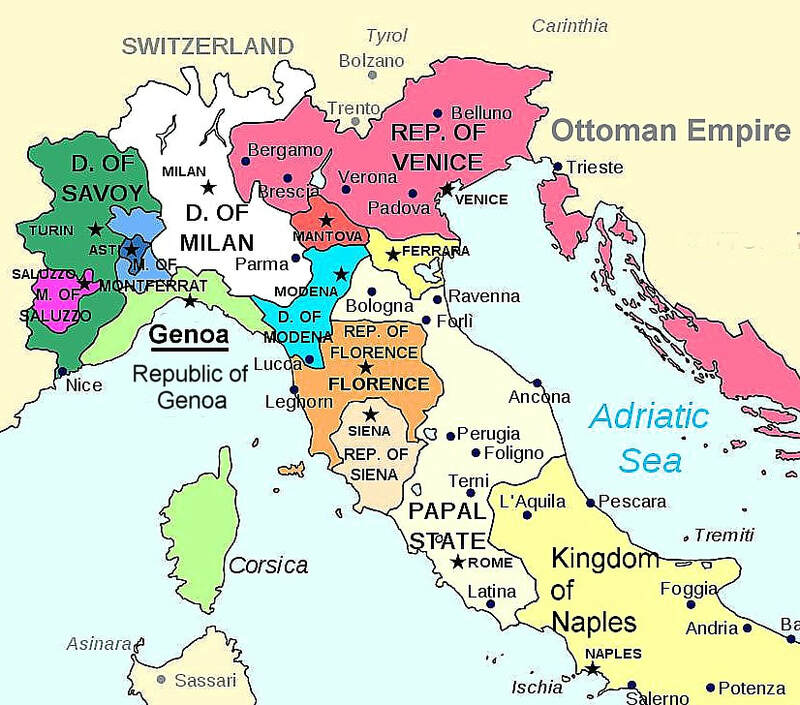 This map shows you which portions of the Italian peninsula were incorporated in the new unified Italy -- and when. Similar to the Italian unification map, this shows the expansion of the new united Germany along with key battles in the Franco-Prussian war of 1870-71. 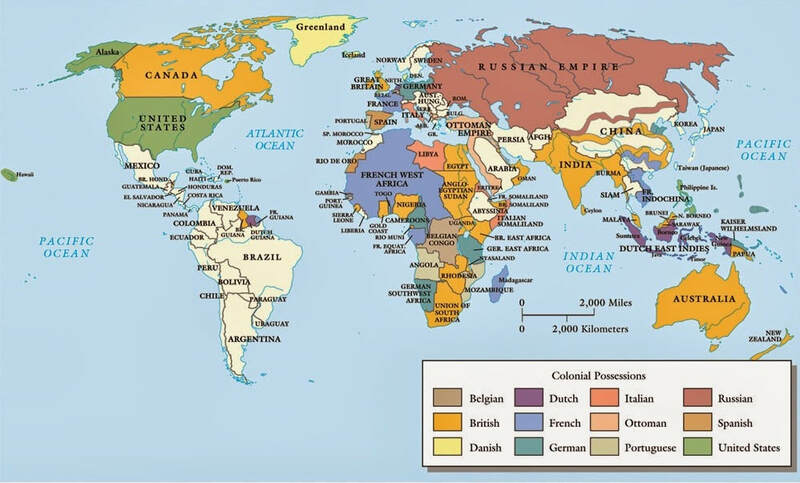 This map shows the extent of European imperialism by 1900. World War I was devastating. The loss of life was shocking to the people of Europe. While somewhat global in scale, the fighting largely took place in Europe itself and was especially devastating in Northeast France. 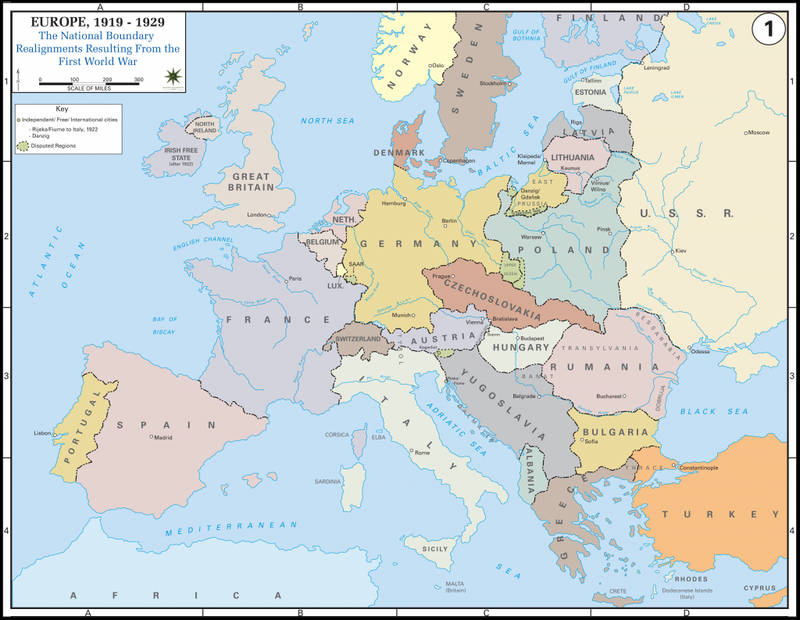 At the conclusion of the war, the "Big Four" nations of England, France, Italy and the United States attempted to redraw the map of Europe to prevent future conflict. The creation of a new League of Nations was also an attempt to resolve conflict peacefully going forward. Russia was not present in Paris, due to the ongoing Russian Revolution brought about in part by World War I, but did eventually join the League of Nations. Most ironically, and perhaps tragically, the United States didn't join the League despite the fact that the U.S. President, Woodrow Wilson, was the main proponent of the idea. The world met in 1919 in Paris to redraw the world's national boundaries. The hope was to allow for "national self-determination" in the hopes of preventing all future wars. 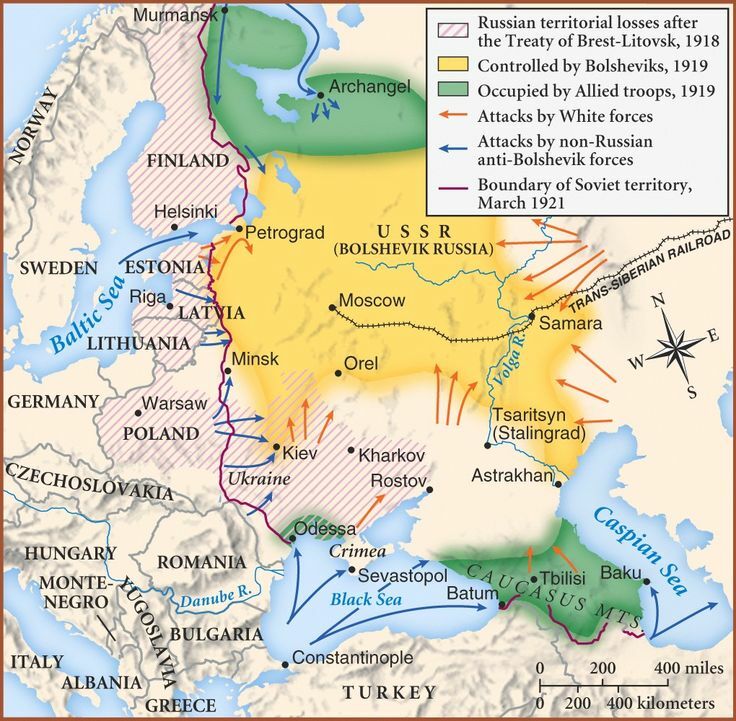 The Russian Revolution was not accomplished in October 1917 -- but rather resulted in a protracted Civil War until roughly 1922. This map shows the territory the new Russian Communist government ceded to Germany in exchange for peace, and the areas of conflict in the coming years. 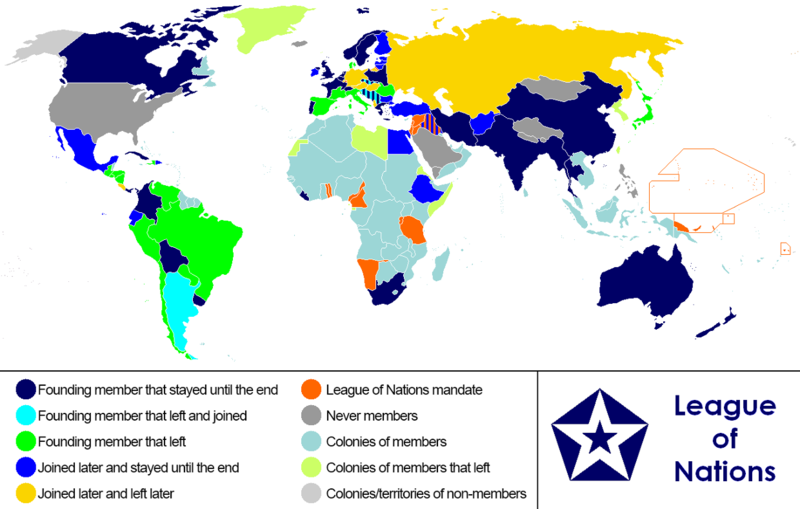 This map outlines who was in, and who was out, of the League of Nations. Keeping track is difficult, and this map highlights some of that difficulty. World War II was the most destructive war in human history, and was truly global in scale. Following the war the map of Europe was once again redrawn, but this time it was divided East-West with the stage set for the 45 year long stand-off known as the "Cold War". 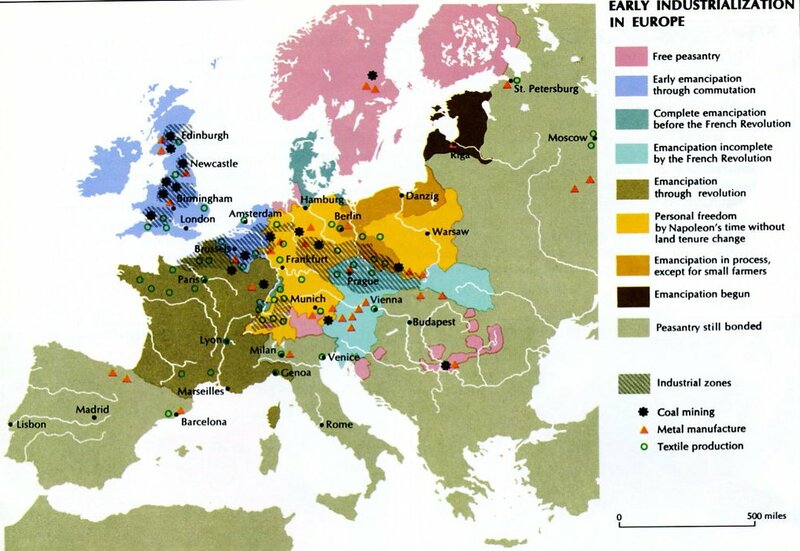 From 1945 until the early 1990's Europe was essentially divided into two armed camps. At the same time new economic zones were being forged. By the 2000's the former Soviet controlled regions of Eastern Europe were growing closer to their former Cold War foes.